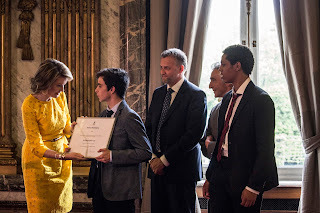 Robert Accoe, winner of last year's Queen Mathilde Award with his care farm "De Kruiskenshoeve" from Sint-Laureins was received at the royal palace to catch up with queen Mathilde on his project. Accoe: "Winning the Queen Mathilde Award has put the spotlight on our care farm for youngsters who are having a hard time. Everyone seems to know us. Secundary schools and higher education institutions keep contacting us, the phone doesn't stop ringing. Even Ghent University wants to know how we motivate young people to get back on the right track. From every corner of the country applies are being made to have a time-out on the farm. It seems everyone is keen get to know our method." De Kruiskenshoeve used the money they won to build a big glass greenhouse where the young people can grow their own vegetables. A way for the boys and girls to discover their capacities and be self sufficient.